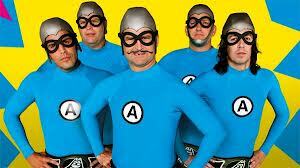 The Aqua Bats! Super Show! Aqua Bats! Super Show! 1st time watching it-Cute show, not really paying attention too much, but the kids sure like it. 3rd time- This show is pretty funny. 12th time- Can we please not watch this? 18th time- I hate these stupid characters. Shut up Caillou, no one asked you! The damn guinea pig needs to knock off that lisp crap! 20th- Please, please, don’t make me watch this again, I will give you a cookie. 21st- Please don’t make me watch this again, I will buy you a car. 39th time- Ha, this is a pretty funny show. Well all of my troubles seem to have disappeared with Aqua Bats Super Show. This Quirky, silly, hilarious, and absolutely ridiculous show is my new favorite. The Aqua Bats are a rock band from Orange County, and have been around for nearly 20 years but I had no idea how much I loved them until this last week. Musically, they are a solid band, and I have been aware of their music for quite some time. I never saw them before, just listened to their music with the burned CDs my brother gave me over the years. A few years back, they also created Yo Gabba Gabba. Seriously. These rockstars are making seriously bitchin kid’s shows. 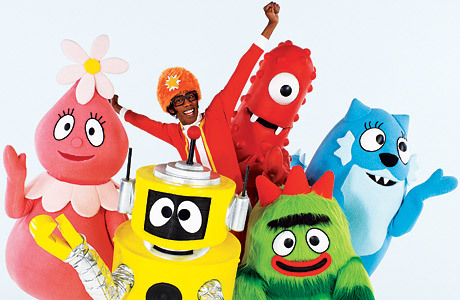 Yo Gabba Gabba is a show that is so odd, it may appear that you have to be on drugs to understand it. Kids like it, and once you actually let it wash over you, you will too. The songs are simple but catchy, the visuals are always stimulating and there are always great celebrity guests like Andy Samberg, Elijah Wood, and my favorite, Weezer. The Aqua Bats Super Show is awesome for different reasons. Whereas Yo Gabba Gabba is a modern take on drug induced delirium of H &R Puff N Stuff, Aqua Bats Super Show is more zany and humorous like Pee Wee’s Playhouse. The band members all have an alter ego. Ricky Fitness, the Commander, and Jimmy the Robot are just a few of the lovable members of the crew. They drive around in their tour van (they occasionally perform) and save the world one random villain at a time. The show is smart, and extremely funny, thanks to its cast having fantastic comic timing. There are also a slew of catchy songs like “Burger Rain” that will be stuck in your head for days. My kids discovered this show on Netflix about two weeks ago and we have gone through the first season’s 13 episodes about 7 times. They just seem to fly by. It’s pretty much the only thing my son will watch, and I don’t mind a bit. I am eagerly awaiting the inclusion of the second season on Netflix, and I encourage everyone to check out the first season. I am A Total Soccer Mom!